Today is Valentine's Day, and what better place to celebrate than Times Square? (If you're already doubting my taste and/or sanity, suspend your cynicism for a moment, enjoy this placating  emoji, and read on.) 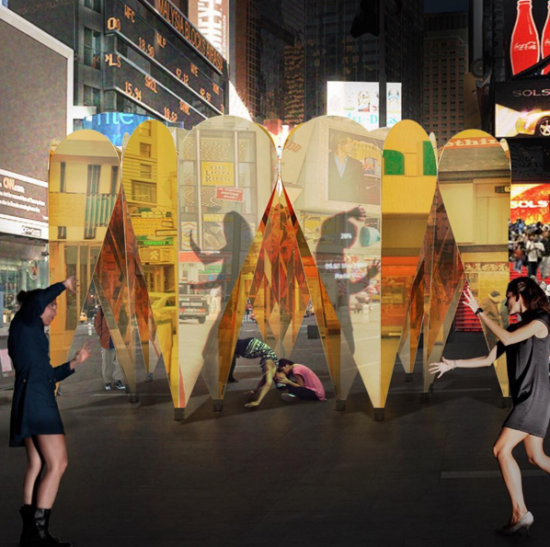 Each year, the Times Square Alliance invites emerging New York architects to deliver a heart-themed installation to the Crossroads of the World, and this year, its competition jury selected New York– and Tucson, Arizona–based Aranda\Lasch + Marcelo Coelho (head of design at Formlabs) to design Window to the Heart, a piece that doubles as the world's largest Fresnel lens and provides a nice public place to make googly eyes at your boo. Working with 3-D printing manufacturer Formlabs, Aranda\Lasch and Coelho printed each segment of the 12-foot-wide lens using clear resin in lieu of glass. 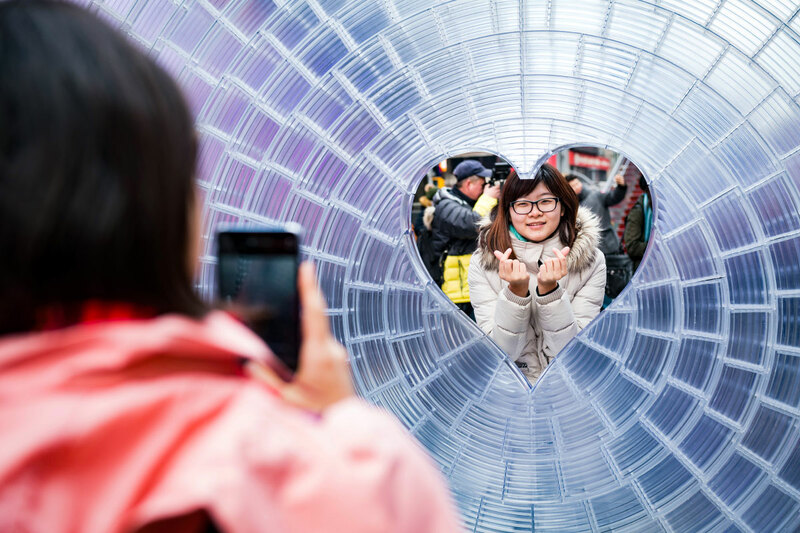 The lens bends the light emanating from billboards and signage to give visitors an ideal selfie sphere, or a place to pick gunk from your teeth before smooching your paramour. According to the Times Square Alliance, which is throwing a fête at the installation today, three couples are using the space as a wedding venue, and three more are planning to propose to their partners. In honor of the heart-fest, AN Products Editor Gabrielle Golenda swooped into Times Square to talk Valentine's Day with couples standing near Window to the Heart: Among the visitors were DJ Drewski, host of a late-night program on New York's Hot 97, and his fiancée Sky Landish, a fitness model. The pair spoke with Golenda about their romantic sojourn: "I think it's beautiful," Landish said. She is clutching a resin panel that was printed onsite by Formlabs: The couple—who got engaged yesterday—said they plan to frame it along with a picture of themselves and hang it in their home. Cute! Planning a visit? The installation will be up near the TKTS booth at Father Duffy Square, between 46th and 47th Streets, through the end of the month. More information on Window to the Heart can be found on Times Square Arts’ website. Today we are pleased to announce with Times Square Alliance Crossroads Conversations, a public program series hosted at the base of the Red Steps in Times Square that invites passersby from all walks of life and political convictions to engage in thoughtful dialogue on some of the most pressing issues of our time in an iconic public space at “The Crossroads of the World.” The first event in the series will focus on immigration, and take place on Monday, March 20 from 6–7 PM. The program invites passersby to participate in 10-minute conversations with a fellow stranger facilitated by journalists at the base of the Red Steps, encouraging people from across the nation and around the globe to reveal multifaceted personal beliefs, provoke robust debate, and find common ground with those who may share differing viewpoints. A pilot Crossroads Conversations event was hosted in December 2016 in immediate response to the divisions evidenced following the 2016 national election. 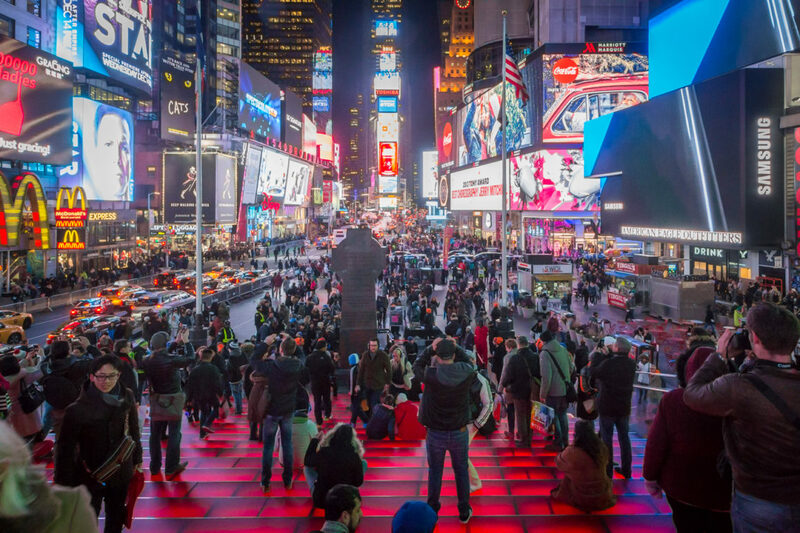 The pilot event fostered compelling discussions and unforeseen viewpoints, inspiring Van Alen Institute and Times Square Alliance to organize future events within a multi-month series hosted at the base of the Red Steps. The Times Square Alliance takes "I ♥ New York" quite literally. 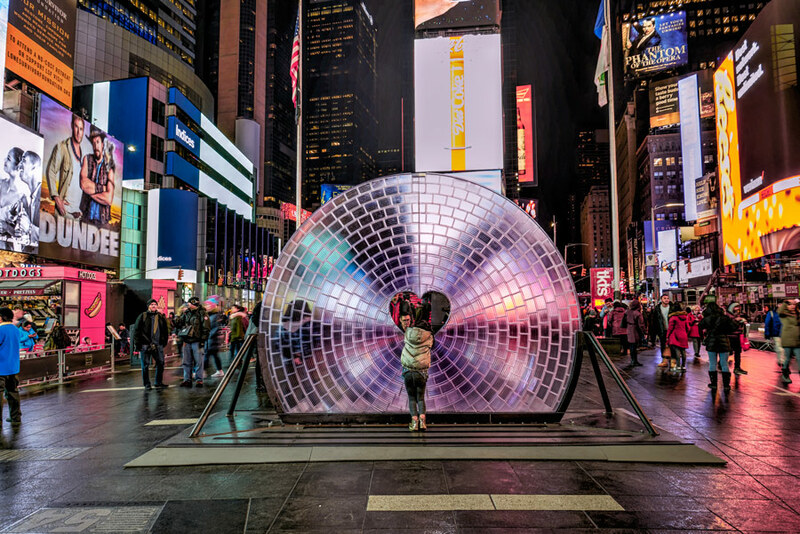 For the past eight years, the nonprofit organization has invited architecture and design firms to create public art that responds to a Valentine's Day theme. 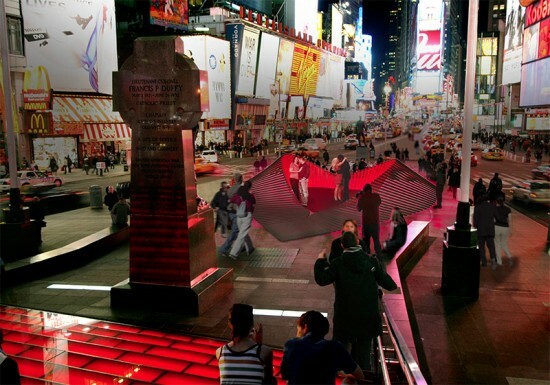 This year the Times Square Alliance partnered with the Center for Architecture to administer the competition. 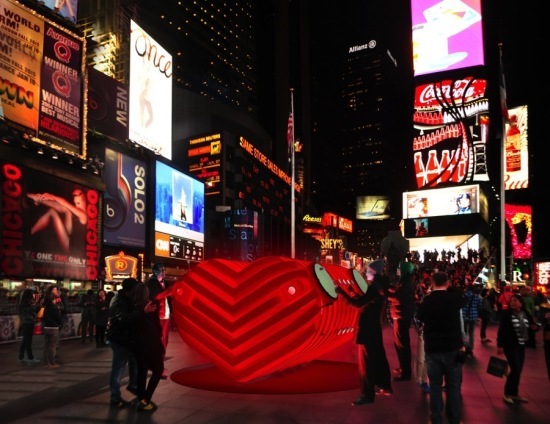 Collective-LOK stole the hearts of jurists to win the 2016 Times Square Valentine Heart Design competition. 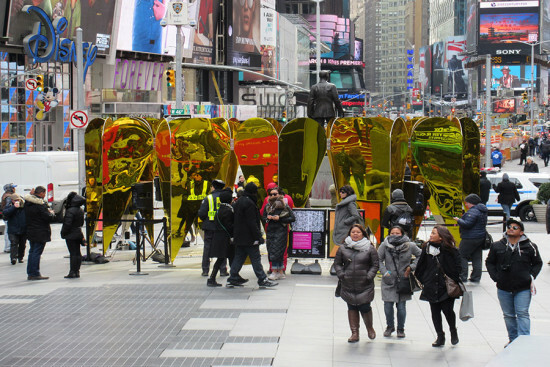 Collective-LOK's submission, Heart of Hearts, is a circle of nine, ten-foot-tall golden hearts that reflect the lights and the goings-on of Times Square. 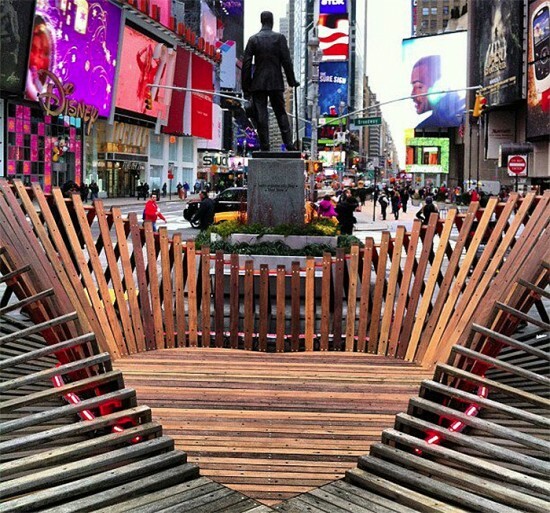 The installation will be on view at Father Duffy Square, between 46th and 47th Streets, from February 29 through March 6. 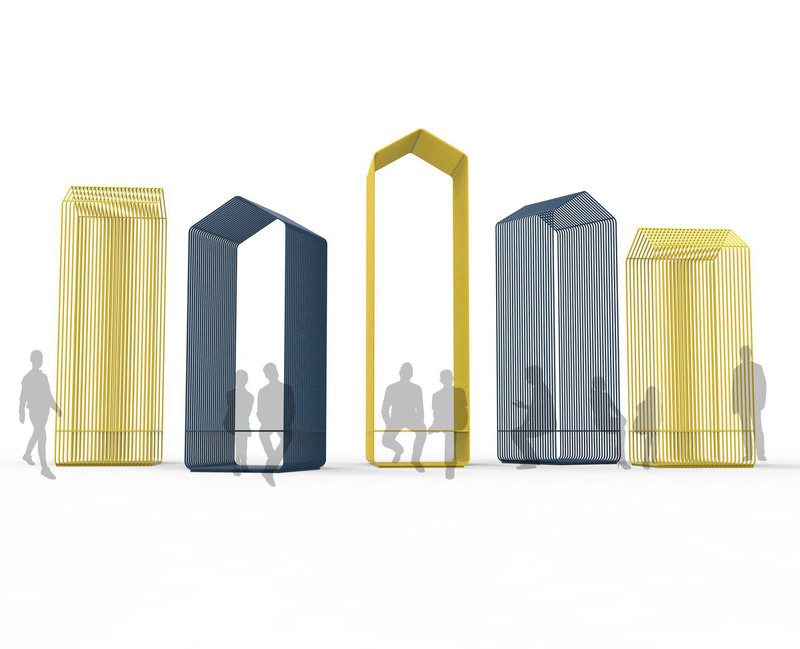 The sculpture is interactive, balancing private and public space in one of the world's busiest pedestrian plazas. Within each heart is a "kissing booth" that encourages intimate but performative affection. 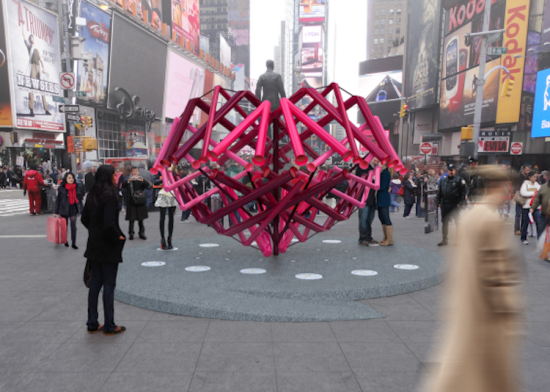 “[We] are thrilled to create the Heart of Hearts for Valentine’s Day, an engagement ring for our love affair with the spectacle of Times Square," Collective-LOK declared in a statement. "It’s truly a special opportunity to provide a space for intimacy and performance in the heart of the city, one we hope visitors will love.” The featured rendering certainly captures the ballet of a good city sidewalk—a llama stares contentedly at its reflection, a lonely man flouting blue laws drinks champagne from the bottle, while the Naked Cowboy jams on, stage left. Why is that man staring into that woman's white skirt? It's all part of the spectacle, apparently. For more heartwarming displays of public art, see AN's coverage of past competition winners here.